Awake before the sun. Eating breakfast in the dark. Packed and moving by six am. The climb out of this valley is beautiful. The sun slants through the trees and the air is cool, almost cold. It makes me think about how the daylight each day is a little less than the day before. A sense of urgency hits me, Canada before the snow! So far, so far to go. The ridge is in the wind, the wind is cold. A stiff breeze from the west. I look to the north and see clouds. A low pressure system? Perhaps. This wind is colder than I expect. I don't stop to put on my windbreaker. I grit my teeth and keep on hiking. The ridges are mostly devoid of trees. Instead I walk through fields of mule ears and lupine. Yellow and purple color blankets the green ridge. On and on, I follow the ridge. Down a little bit, then another ridge. More wind, more mule ears, more lupine. Off to the north the bare rocky peak of Sierra Buttes stands alone. I've always wondered where it was in relation to everything else. From here it stands alone like the volcano mountains of the Cascades. I sort of looks like Mount Jefferson in central Oregon. Another ridge, a little closer. Sierra City is nestled in valley at the bottom of Sierra Buttes. I'm not sure why it's called Sierra Buttes when it looks like a mountain. I'm off the ridge. Suddenly the trail turned and dropped down below the ridge line. I'm traversing across the hill to the east of Jackson Meadow Reservoir. The forest is open I can see the water intermittently through the trees. So many trees. So much forest. I heard that song when I was a kid. I'm not sure what the author’s meaning or intent was. Perhaps the intent was to show the bear was making a futile attempt to see something new but instead just saw the other side of the mountain. I was always inspired by the song. I was the bear. The other side of the mountain was always enough of a reason to go over the mountain. I remember going to parks as a kid and exploring the trails. Has far does it go? Where does it end. I remember the disappointment I felt when I reached the fence. The forest goes this far and no further. The houses are right back here. Even camping as a Boy Scout in the Oakland hills. The limit of the forest was close. The encroaching homes placed a clear line around the ‘wild’ area. Here I am going over the mountain, I see the other side, no fence, another mountain. Trees, trees, and more trees. Mountains covered with trees on and on and on to the horizon. This is what I dreamed of as a kid. The bear can keep going. I am the bear, I am going on. I am so inspired, the forest is the same on this side, but yet it is also different. Not only that but I am changed by the journey. The desert with its drama is gone, the High Sierra with its cascades, snow, and scary peaks are gone. Just forest on and on forever. I wonder what I'll feel when I reach Canada, no fence but an end of a journey. Ah well, that's still fourteen hundred miles ahead it's not something to worry about today. The trail is smooth and rolling, fun to follow. My legs feel strong. My right knee feels normal. Was my injury related to my shoes or insoles? Don't know, all I know is my feet feel great. My shoes are so comfortable. I choose to hike on to the town. Originally I planned to camp about four miles from town, but why? I feel good. I haven't seen another hiker for hours. I walk and walk, seemingly tireless. I eat as I go. I consume the crumbs of the three remaining chocolate chip cookies. I eat my snacks. All I need is food and water. I can gone on like this forever, or so it feels. The trails leads over the lip of a canyon and down. Down like down is important. Way down. Down more than I thought. I can't see the bottom. Switchbacks, follow the switchbacks, back and forth and always down. Rocky, sharp rocks, down. Back into the forest. A different forest, older and wiser. Giant trees, always down, down beneath the trees. The creek appears, rocky and flowing beneath the trees. There are bridges to cross the creek. It's beautiful. The trail follows the creek. Down the the warmth of lower elevations. Much warmer, high seventies? Maybe eighties. The shade of the forest keeps me cool. The exposed areas feel hot. There is the trail to Sierra City. It's a shortcut. I pass it and continue to the highway. Another two miles. I'm climbing again. The trail is steep. Up and up then just as suddenly, down. 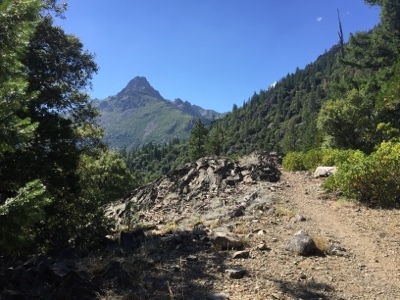 Down switchbacks, quick short one down to a bridge over the North Yuba River. A sharp rocky cascade similar in look and feel to any of the rivers in the High Sierra. A steel bridge with an arch in it is my ticket across. I'm glad I don't have to ford this scary stream. A short climb after the bridge and I'm at the highway. A van approaches, I put out my thumb. The van pulls over and I have my ride to town. Sierra City is a dream town for Thru-hikers. The store is the place to be. Free high speed internet. A grill making burgers, pizza, sandwiches and fries. Kelli shipped my package to the store, express. I ask about it. They point to the back where there are mountains of packages. I wander through the canyons between the boxes searching for purple tape. Two days! Bam here it is! I have food. I won't have to wait until Monday. Yay for the U. S. Postal Service. I have where all the Thru-hikers have gone. They are in Sierra City. A whole slew of them. Another name for us is hiker-trash. We are all so filthy dirty it's surprising to me how many communities are so welcoming. I guess it's the fact that we spend money. Sierra City has installed public showers. Cold water, thirty seconds at a pop. I decided I didn't need a shower, I'm not the only Thru-hiker to make that decision. We hang out on the porch of the store. A trail angel distributes a few bottles of wine. Hmmm, probably would be good if I had a wine glass drinking wine from the bottle has connotations of wino. I head up to the church where free camping is available for hikers. I make my dinner on the one picnic table under the trees. A few of the other Thru-hikers are at the same table partying. It is Friday night after all. They are playing music probably louder than the neighbors appreciate. I set up my tent in the yard with all the other tents. I see Obiwan and chat with him a few minutes. Then I see Big Hunk and spend a few minutes chatting with him. So there are a few Thru-hikers I know. The store closes and more thru-hikers migrate to the church yard. I visit the public restroom and towel myself down, no cold water shower for me. I climb back into my tent and install my ear plugs. They are not super effective against the racket outside but I think it'll quiet down pretty quick when it gets dark. Besides I don't have to leave early tomorrow I have friends meeting me for breakfast.